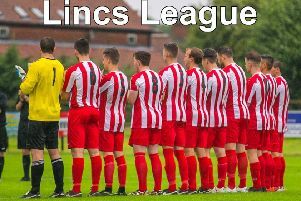 Brigg Town Reserves consolidated their fifth place in the Lincolnshire League as they finished their season on a high note by completing a league double over Skegness United. Indeed this was the Zebras’ fourth win in four as they wrapped things up in fitting fashion. Leading goalscorer Ben Brown notched his first goal since February 20 to take his season’s tally to 11. Also on target for the home side was David Deane and Christopher Rodgers. James Gray opened his account for the visitors, who slipped into the bottom three on the back of their third consecutive defeat. * Market Rasen Town, meanwhile, finished their campaign last Wednesday with a sobering 6-1 home defeat to title chasing Hykeham Town. They ended the season second-bottom with four wins and two draws from their 22 matches this term. Despite the heavy rain and snow showers, the surface at the Memorial Hall ground was in remarkable condition. The home side prepared for this week’s county cup final at Sincil Bank with a professional performance, completing a league double in the process. Josh Raby gave them the lead to settle their nerves early on and an under-strength Horncastle struggled to make any impact. The points were sealed when Chris Funnell notched his 13th league goal of the season. On Saturday, Hykeham travel to Cleethorpes Town Development Squad. A brace of goals for Jack Barker took his tally to four for the season as CGB Humbertherm climbed out of the bottom three. In his first game since the Therm last avoided defeat – at home to Lincoln Railway AFC last month – Carl Martin scored the other goal. This victory ended a run of five games without a win for Therm, who will now have a chance to influence the destiny of the championship trophy. They play the top three in their final three fixtures. Elsewhere, Wyberton’s clash with Lincoln Railway AFC, and Cleethorpes Town’s home match with Sleaford Town Reserves, both fell victim to the weather.